The construction of models of ship remains is a tool that can be used to understand information derived from archaeological and historical research. 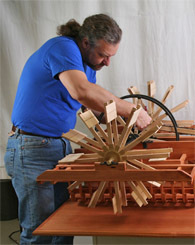 Glenn Grieco, a graduate of the Nautical Archaeology Program at Texas A&M University, is a professional ship modeler. To view reports on each model, please follow the links at the top of the page. We actively seek contract work to build to your specifications any scaled model of a historical ship. Model projects built under the Nautical Archaeology Program at Texas A&M come with the added bonus of undergoing extensive research to ensure that models are built as historically accurately as possible.